The absolute best thing about being up early in the morning, is that you get to enjoy the sunrise. The morning of my second nav flight was certainly no exception. I was excited, there appeared to be no wind and the sky looked like there were all but a few clouds, maybe just enough to add to the sunrise. How that all changed! It was 7am and it was straight to work on my navigation plan. Adam had texted me the details of the flight the day before. It included a Jandakot to Armadale departure. From there we’d climb out and track straight down to Narrogin. On arrival at Narrogin we’d determine the right runway and do some circuits. Then, we’d depart to the North to Beverley, then a left turn to Mount Dale, Byford and then into Jandakot. I may have taken the opportunity the night before to draw all the tracks on the VTC, VNC, WAC and the ERC Low. To add to that, details were written out of the ERSA and CAG on my flightplan. It took a good hour to get everything in order. Unfortunately the printer wasn’t working, so I couldn’t print the weather or the submitted Air Services flight plan. So took the liberty this time to use the NAIPS iPad application and saved them electronically. Tempted as I was, I did at this point put the iPad away and did the flight planning by hand. Being more efficient with the E6B flight computer this time around, meant it didn’t take too long. With all the paperwork done, maps ready, it was time to ready the plane. Todays plane was again VH-IGY. 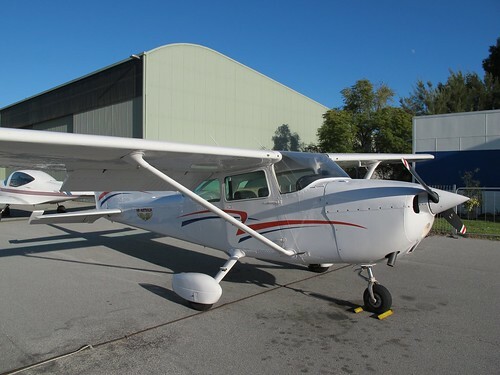 It is a Cessna 172N with a 180hp engine upgrade. 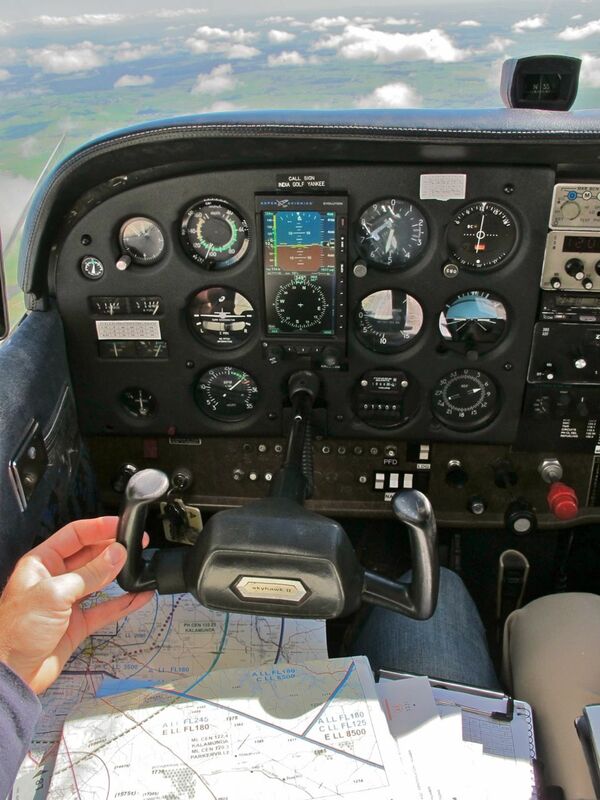 The benefit this particular plane brings to navigation is that it has an electronic Directional Gyro (DG), which never goes out of sync with the compass. It also has a digital readout, so you can hold a near exact direction. Its navigation TAS is 115 knots, which is about 10 knots better than a standard 160 hp machine. In fact, this aircraft and VH-BEZ can often pull a good 130 knots in cruise with the balls to the wall. Not bad for a C172, however I’m certainly looking forward to getting my Mooney rating, coz the 160 knots they can pull will make getting from a to b a lot quicker. With everything done, we made our taxi calls and headed out to runway 06 right. There was the usual delay with this runway as the planes in the circuit seemed to keep coming. No sooner had we noted the time down and set the transponder, we got our line up call. It was quickly followed by “clear for take-off” as the Aero Club C152 peeled off the runway ahead of us. With a right turn, it was 115 degrees towards Armadale. This was to be the first time that I’d leave the limited Jandakot airspace to the east while at the controls. Ye ha! Again, noting our time over Armadale we steered towards Narrogin and commenced our climb towards the 3500 foot limit in this control area. However both were short lived. It would be while before we reached our targeted altitude and we had to steer off our track to dodge the huge clouds. The cloud cover resembled broken clouds, rather than the scattered clouds indicated in the forecast. It kept us to around 2500 feet as well as needed to track well to the north of our intended track. While literally off course even at the start, I kept sight of one of the major roads out into the hills which I was able to also identify on the map. Making the call to Perth Radar, we requested flight following. This is the process of Perth Radar identifying you from your transponder and informing you of other traffic. They identified us at 7 miles east of Armadale and let us know there was no other traffic. At this stage we continued to skirt around the clouds while keeping the best visual reference on key features we could. This continued for a good 15 minutes, so it meant we were well off our intended track. As the clouds started clearing, we’d decided we were now well clear of the 3500 foot control area, so we climbed out to our cruise altitude of 5500. The pressure of getting back on track was on. Being able to take a positive fix on town and road intersection, I did a one in sixty calculation. We’d calculated we were about 3 miles off our course, so using the simple maths, I calculated our new heading. 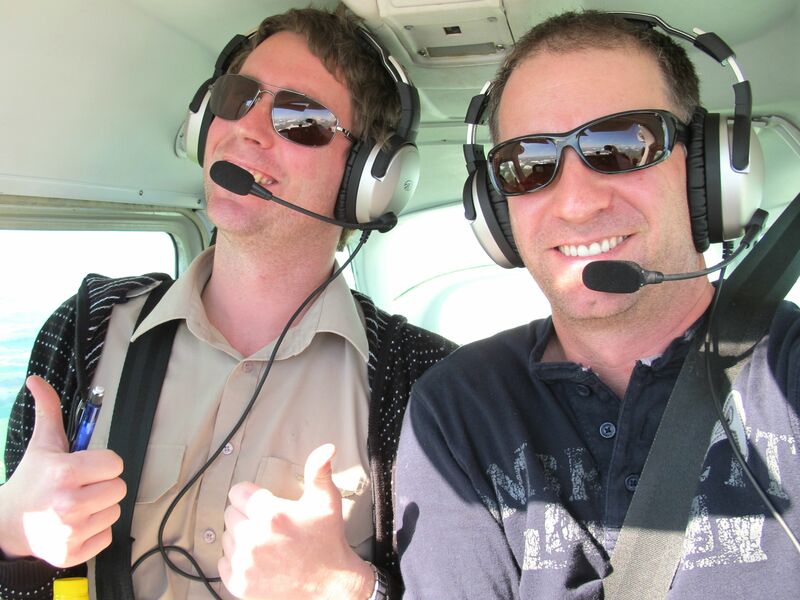 Taking the opportunity, I was also able to re-calculate our accurate ground speed and work out the ETA to Narrogin. Keeping on the new heading, the focus was on the CLEAROFS. By the time we’d gotten through those and were satisfied we were on track, we’d just passed the 10 mile distance from Narrogin. I put in the radio call to announce our pending arrival. It all happens pretty quick from here. Decending down to 2100 feet, amazingly our new track had us arrived directly overhead the airfield. We found another Cessna 172 and a Crop Duster buzzing about the Narrogin airfield. We worked through the intentions with the other Cessna, which happened to be a young lady with her instructor doing touch and go’s. They were doing circuits on runway 10. We overflew and descended on the non-live side of the runway (the side opposite the circuit direction) crossed midfield and then followed the other Cessna. As we followed them around, we got ready to come in for landing. When turning base and then final I was finding that we were getting close to the runway and that we’d have little chance of making it in, other than a dive bomb. At around 150 feet above the runway I decided to go-around. It was at that time I had a good look at the wind-sock and realised that we were actually trying to land with a tail wind, rather than a head wind. What was this other plane doing! They were actually departing, so we left it at that. We turned cross-wind and then downwind. At that time we turned back across the runway to switch the circuit direction for the same runway, but in the opposite direction. Now lined up for runway 28, it was all good and we made a serious of touch and go’s. From Narrogin we departed to a north’ish direction towards Beverley. By this time the clouds had thinned and the track was pretty easy to navigate. Once about 8 miles out of Narrogin, there was a road which pretty much ran straight to Beverley. It was a case of tracking it all the way. Sweet I thought. It was at this point that Adam pulled the power and it was time for a Practice Forced Landing (PFL). It went pretty well as there was a stack of really good locations to set down. At about 500 feet(ish) we went around and I commenced re-tracking to Beverley. The first thing is to hand draw the track onto the map we need to fly. Then as we fly over turning waypoint, note the time and turn onto the estimated heading. Now on our heading we work out our cruising altitude. We take into account whether we need an odd thousand or even thousand level, the clouds, airspace and terrain. Having calculated the track and altitude, we started our climb up 1000 feet. Once that was sorted, I ran through my CLEAROFS. With those done and while trying to spot reference points, I began more accurately calculating the flight heading. No sooner had we aligned to our new heading, those pesky clouds came into play again and we had to literaly dive bomb underneath. This added to the heading issue because to get beneath them, we had to change our heading considerably to slot into a gap between clouds. With that out of the way and the CLEAROFS mostly done, it was the “Orientate” step that presented the next challenge. Finding where you are seems to be a challenge at times. We were still off the boundaries of the more detailed VTC map. The VNC had only major roads and a few other features. Luckily in this case there were silos and another airfield. Sweet, a positive fix and now it was time for a 1 in 60 to get back on track. From here on in, the dead reckoning approach to navigation came into play. We could make out a few “mountains” and in the distance the coast. Between us and the coast was our destination, with Serpentine dam in the middle. It was of course the point near Serpentine dam that it occurred to me that I had exactly 50 minutes till my softball game started! With this, it became a mission to get the flight over with and on my way. From Serpentine Dam we decided that a detour directly into Forrestdale Lake into Jandakot was the quickest route back. The extra 20 minutes to fly overhead Serpentine airfield was out the window. Doing a normal Six South arrival, runway 30 was in use. We hoped for a straight in approach, but instead were given a join upwind instruction. This became a slight challenge as there was an Tiger Moth taking off and another aircraft joining downwind from the opposite direction, with a helicopter also arriving just below circuit height. We solved that with an early turn cross wind and did a reasonable crosswind landing. The good thing here is that it is a 2 minute taxi back to the Southern Apron. Taxing back in, we covered a few things for improvement, luckily all of which were not too big a deal. The first item was non-controlled procedures, the other was about maintaining height when doing the map work and logging. The navigation he thought was pretty good, which I was relieved about. 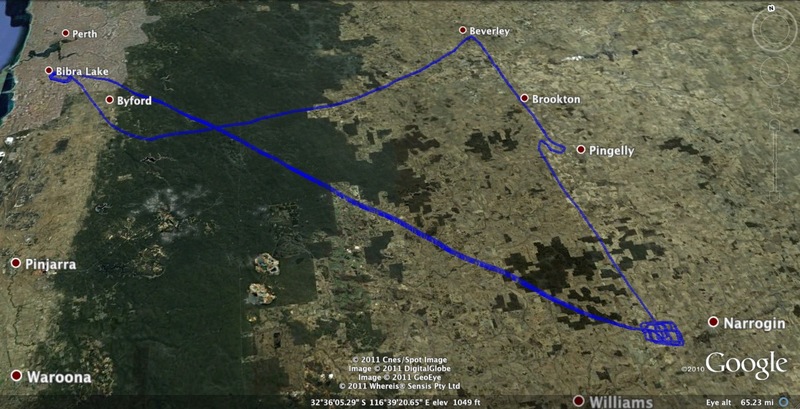 Below is the GPS track of the flight, which gives a good indication of the navigation correctness (the funny hook track near Pingelly was a Practice Forced Landing). 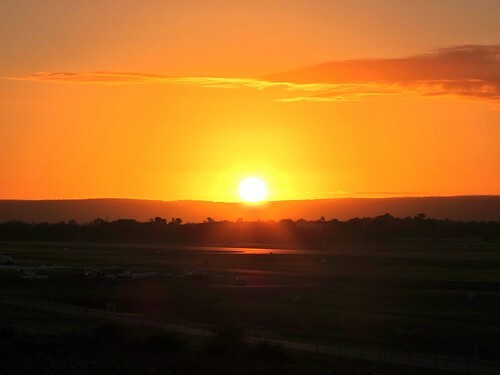 This entry was posted in Jandakot, Navigation, Pilot License and tagged aviation, Beverley, C172, Cessna, cross country, crosswind, E6B, flight computer, Jandakot, Narrogin, navigation flight, Plane, Serpentine, Sunrise, VH-IGY. Bookmark the permalink. Great read, thanks. PS that “electronic DG” is an Aspen 1000 and is a lovely ($10,000 plus inastallation) piece of kit. Thje luxuries students have now adays! Thanks for the comment Stuiart. It seems everything aviation comes with a big price tag. The DG is very nice and as a student a little on the “very easy” side. How was your world trip? Keep up the good work mate…and the great writing. Thoroughly enjoying every blog. Awesome article. I ignored the mrs for 15mins reading this…. was great! I am currently training in the 172 igy great machine I must say. Would like to chat with you more on your training etc if you got any pointers. Im loving every minute up there and your article is pure motivation to keep going. And for that…. I thank you!